· Introducing Mini Lily, a Drone with Camera that can capture stunning images and videos thanks to its 2MP HD camera, its great flight stability and its new Height Control function. It is a Drone specially designed to get started in aerial filming. Its large size, HD camera and special functions such as Altitude Hold, Headless Mode and One Key Return make this RC Drone a more than perfect option for novice pilots. Features of Drone Mini Lily HD: 2MP HD camera for photos and videos from the air. Photos and Videos are stored on the included memory card. 2.4Ghz transmitter that guarantees a strong signal free of interference. Two selectable flight speeds. Auto-take off function. Height control mode so that the drone stays automatically at the height you want. Headless mode function to always know the flight direction of the Drone. Automatic return function for the Drone to return to where the station is located. Able to perform 360º Loopings at the touch of a button. Powerful LEDs for easy orientation. Mini Lily Drone Specifications: • Drone Size: 42 x 32 x 15cm • Drone Weight: 600g • Flight Time: Up to 10 minutes. • Interference free 2.4Ghz control frequency. • Control distance: Up to 200 meters. • 6-axis gyroscope. • Camera: 2MP HD • Drone Battery: 7.4V 1800mAh LiPo • Batteries for the transmitter: 6 x 1.5V AA Not included. Includes: • Drone with Camera • Transmitter • 4GB SD Card • USB SD Card Reader • 2 Spare Propellers. 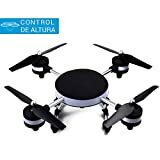 • Charger, battery and tools • ManualRequires: • 6 AA batteries for the emisorArctecnic.com, drone shop with guarantee of confidence, real stock in Spain.